What do we do about the unrelenting Jewish Hate? (FinalCall.com) - Everyone who heard The Honorable Minister Louis Farrakhan's New York radio interview on January 2, was more than a little taken aback. Clearly, the program's hosts were as disconcerted as the listeners at the alarming message The Minister had for those who may have been expecting a New Year's benediction. The business arrangement he made with Johnson Products to manufacture the NOI's P.O.W.E.R. personal care products. The significant fact about all of these initiatives is that they all failed, and they failed as the direct result of the nefarious intervention of Jewish people. Let us be clear: the “free” NAACP folded on this historic unity pact because its funding was threatened by Jewish leaders; the “free” Black bankers actually asked The Minister to close out his $5 million account because they felt threatened by the powerful Jewish banking network; and the “free” Black entrepreneur Mr. Johnson refused a lucrative business deal with his own Black people because he was threatened with losing access to the Jewish distribution networks for his Ultra Sheen line. Since 1983, The Hon. Min. Louis Farrakhan has suffered a vicious and unrelenting assault on his character and life that no Black man in history has ever had to endure. Twenty-eight years of unremitting hate has been directed at him by the Jewish community, who have falsely, but quite strategically, labeled him a “hater,” a “bigot,” and an “anti-Semite.” That is longer than the 27 years Nelson Mandela was locked in Robben Island prison! By the reckoning of the frightened among us who view the Jews as having great power in all affairs, The Minister should bow in apology to the offended “Chosen People” and beg their holy forgiveness. To them, his decision on June 26th of 2010 to forcefully correct the distorted historical record and to clear his name of this odious and persistent charge is simply more evidence that he has “Jew on the brain” or that he is “obsessed” with our friends the Jewish people. • Candidate Barack Obama has to publicly repudiate The Minister in order to be elected, and thus eschew desperately needed divine guidance for our nation because of the charge of “anti-Semitism.” The racial undercurrent of the 2008 presidential race was that ANYONE associated with Min. Farrakhan must be nullified. • Min. Farrakhan is not invited to national Black roundtable events because of fear generated by the false charge of “anti-Semitism,” denying our people true and necessary guidance. • NOI ministers, for all intents and purposes, are barred from speaking at our universities, disconnecting our learned from the power of the Messenger's program. “Anti-Semitism” is the motive. • The highly effective anti-drug “Dope Busters” were denied contracts for security at America's Black ghetto projects due to Jewish pressure on Congress. • The Minister has been banned from the United Kingdom since 1986, at the insistence of Jews. 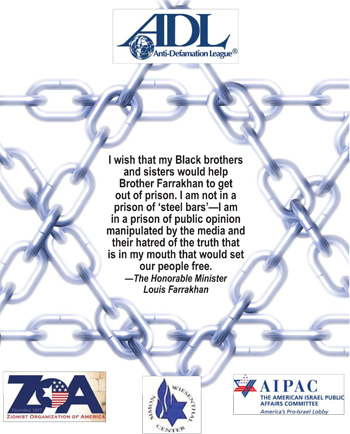 In 1994, a secret memo of the ADL titled “Mainstreaming Anti-Semitism: The Legitimation of Louis Farrakhan” asserted that Jewish organizations need to “impose an obligation” on “mainstream leaders in the black community…who deal with” The Minister. The ADL determined that “the burden should be on those who give Farrakhan some measure of credibility to insist that he act responsibly, and put a lid on his bigotry and anti-Semitism.” And none of this evil plotting speaks of how the Jewish organizations will help Black organizations solve the chronic problems that Blacks face—only about how to break up ANY relationship they have with Our Minister! Under it all, quietly and unobserved by most of our people, The Minister's legacy is being manipulated by a pernicious campaign of libel targeting future generations. Books that refer to The Minister in the rudest manner are published and placed on library shelves all around the world like ticking timebombs of historical hate, so that future generations of students will see him and us like Black Klansmen and terrorists. Some of the books are designed purely for academic use and thus are assumed to be the vetted, authoritative, and reliable words of “experts.” This includes, for instance, Merriam-Webster's Encyclopedia of World Religions, which calls The Minister “a compelling orator whose rhetoric sometimes fell into overt racism and anti-Semitism …” And Antisemitism: A Historical Encyclopedia of Prejudice and Persecution: “Louis Farrakhan has emerged as the most visible and vociferous African American antisemite on the contemporary scene.” And this sampling excludes the internet sites, which also have an ominous lasting power to promote slanderous ideas. The Nation of Islam's enforced absence from college campuses, housing projects, public schools, prisons, the economic marketplace, national politics, and from the world stage imperils us all, and in these crucial times Pres. Obama is being pulled into the enemy's corrupted sphere. We have found ourselves in a box, and the sad truth is many of us have no idea we are in a box and even less of a notion about who put us there and why. What might our progress have been if, for instance, The Minister was welcomed on ALL university campuses as the invited guest of the dean—like he should be? What happens if they fight over him to address their commencements? What happens if the Dope Busters are contracted for EVERY housing project in America? What would that have meant to the struggling families of our highly trained FOI Brothers and for the desperate project residents? What if, then, with the emergence of peace and safety, the Sisters came in and set up education and other social services for the families in these housing projects? And what would this new peaceful innercity environment mean for the growth of business? Have we thought about what this charge of “Anti-Semitism” has cost us and our people? This is utterly distressing. We are The Minister's “Black brothers and sisters,” and WE are duty-bound to “help” our Minister get out of prison! After all that man has done for ALL OF US! After ALL he and his family have sacrificed FOR US! How have WE let these Jewish Men of Sin put the Man of God in prison?! The only questions we should have are, What prison is he in and How fast can we get to him?